As I drove into town a few days ago, my mind raced. I had errands to run, daughters to visit, and grandchildren to play with. Then suddenly, my thoughts pulled off the busy highway of my mind and I was overcome with the longing I often feel to be in the presence of those I love. I thought about how I long to be in the presence of my mom and dad...I long to be present with our daughters...I long to spend time with my sister and brothers...relatives and friends...I long to share life with them...not for a big event or anything special...just an ordinary day...just a cup of coffee or tea...just a sandwich or a snack and some conversation. But we all have lives to live, work to be done, responsibilities to fulfill. Sometimes the intensity of that longing brings tears...sometimes sweet memories and smiles...sometimes I make myself a promise to make a phone call so I can hear the voice of one I love. I wondered if God longs for us that way...and I believe He must. "And I will be your Father, and you will be My sons and daughters", says the Lord Almighty (2 Corinthians 6:1). God is the author of family. Isaiah 66:13 says, "As a mother comforts her child, so will I comfort you..." And Isaiah 49:15-16 says, "Can a mother forget the baby at her breast and have no compassion on the child she has borne? Though she may forget, I will not forget you! See, I have engraved you on the palms of my hands..."
It is easy to see that, since we are created in God's image, we bear resemblance to our heavenly Father. We have multiple roles...we are children, siblings, parents, grandparents...and His love runs in and through each of those roles...teaching us, loving and helping others through our gifts of time and service...always drawing us to Himself regardless of which role we currently play. I am learning to be free in love. Free to love and be loved. Free to allow God to orchestrate and direct my days and free to trust Him to lead. This kind of freedom makes me want to run to God just to glimpse His face. To see Him look at me the way my parents looked at me when I was a child...to see unconditional love...and to feel that love completely. Then, in turn, I want my others to see that same love reflected on my countenance when they see me. I'm grateful it is a process...and I'm grateful God is in control of it! 1 John 4:12 says, "No one has ever seen God; if we love one another, God abides in us and His love is perfected in us." Love on, my loved ones...love on. 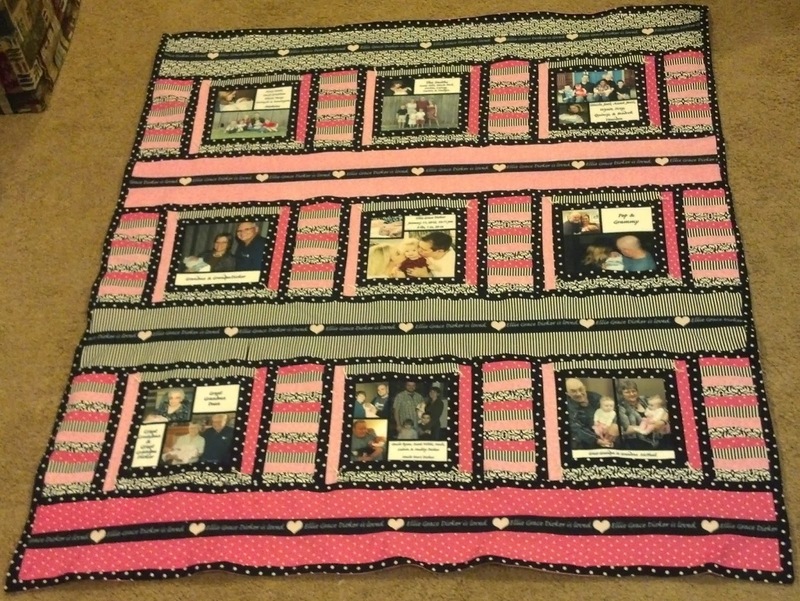 When Lou (our first grandchild) was about to turn one, I got the idea to make her a photo quilt. I figured that given advances in transferring photos on to fabric it would be easy...and it wasn't hard...edit photos, print, sew, bind, tie. 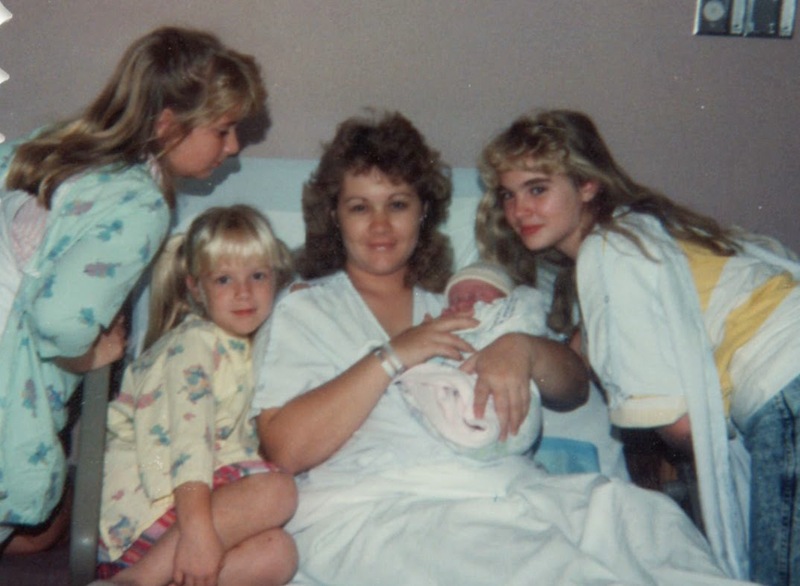 What I could not have known then was that we would have a lot more grandchildren fairly close in age and that the precedent I set with the first one would need to be carried on. When Bub was born three years later, I made his quilt for his first birthday...easy peasy...then we had a family explosion. Bubba came a little more than a year after Bub, then Superman followed seven months later, SG arrived three short months after him. Four months after SG, Wubba was born, followed by Spiderman eight months after that. Then we slowed down...over the following three years, we welcomed Ladybug, GB, and Q. Then we had a dry spell followed by a deluge...of Bitty Princess, another Super Hero, and Lil Ruthie all born within three months! Yikes! Five months after that deluge, we welcomed Baby D and Baby E who were born five months apart...and lastly (at this point), we added another princess to the Royal Family. The photos on the quilts fade as they are repeatedly washed...but they are still loved. Some of the kids call them their "Love Quilt", others call them "Grammy Quilts/Blankets". I'm so glad they are used and that these precious ones will have memories of the warmth and comfort they feel wrapped up in them. I am not a true quilter in the sense of perfect piecing and quilting (either by hand or machine) and I am still learning. It seems that each first year quilt takes on a life of its own...the mommies pick out fabric colors, patterns and photos and I go to work. The final product is as unique as the one year old receiving it. I began by printing the photo blocks on special paper that is then ironed onto fabric and as technology has improved, I printed directly onto the fabric. The photos for the latest quilts have been printed onto fleece by Shutterfly and I cut the blocks out and sew them into the quilts...so far, the photos have been best preserved by this latest option. What an honor to remember our sweet kiddos and their first year with the Four Sisters Farm Family!